Ada sejumlah aplikasi dalam pengenalan pola yang membutuhkan citra dengan ukuran tertentu. Ukuran citra menentukan hasil dari pengenalan pola suatu sistem. Suatu metode interpolasi digunakan untuk menyesuaikan ukuran suatu citra. Kualitas suatu citra terinterpolasi bergantung pada metode interpolasi yang digunakan. Image Quality Assessment (IQA) memainkan suatu peranan penting dalam berbagai aplikasi pengolahan citra seperti peningkatan kualitas citra, kompresi citra, restorasi citra, dan lain sebagainya. IQA sangat dibutuhkan karena suatu citra dapat mengandung beberapa tipe derau seperti derau blur, perubahan kontras dan sebagainya. Pada penelitian ini dibandingkan 4 buah metode interpolasi yang digunakan untuk meningkatkan kualitas citra. Keempat metode tersebut adalah Nearest Neighbor Interpolation (NNI), Bilinear Interpolation, Bicubic Interpolation dan Nearest Neighbor Value Interpolation (NNVI). Metode-metode ini dianalisa dengan IQA. IQA yang digunakan adalah Image Quality Assesment Metrics (SSIM) dan A Feature Similarity Index (FSIM). Metode Bicubic Interpolation menunjukkan nilai yang paling baik untuk PSNR, SSIM dan FSIM. Metode NNVI menunjukkan nilai yang kurang baik dibanding ketiga metode interpolasi lainnya. Metode Bilinear Interpolation dan NNI memberikan kualitas yang berada ditengah-tengah antara metode Bicubic Interpolation dan NNVI. S. Fadnavis, "Image Interpolation Techniques in Digital Image Processing: An Overview," in Int. Journal of Engineering Research and Applications vol. 4, ed, October 2014, pp. 70-73. T. M. Lehmann, C. Gonner, and K. Spitzer, "Survey: Interpolation Methods in Medical Image Processing," IEEE Transactions on Medical Imaging, vol. 18, pp. 1049-1075, 1999. R. C. Gonzales and R. E. Woods, Digital Image Processing 2nd Edition: Prentice Hall, 2002. D. Han, "Comparison of Commonly Used Image Interpolation Methods," Proceeding of the 2nd International Conference on Computer Science and Electronics Engineering (ICCSEE), pp. 1556-1559, 2013. C. Khare and K. K. Nagwanshi, "Image Restoration Technique with Non Linear Filter," International Journal of Advanced Science and Technology, vol. 39, February 2012. R. Kreis, "Issues of Spectral Quality in Clinical H-Magnetic Resonance Spectroscopy and a Gallery of Artifacts," NMR in Biomedicine, vol. 17, pp. 361-381, 2004. I. Avcibas, B. Sankur, and K. Sayood, "Statistical Evaluation of Image Quality Measures," Journal of Electronic Imaging, vol. 11, pp. 206-223, 2002. J. E. Farrel, "Image Quality Evaluation in Colour Imaging: Vision and Technology," MacDonald, L. W. and Luo, M.R. ed: John Wiley, 1999, pp. 285-313. Y. A. Y. Al-Najjar and D. D. C. Soong, "Comparison of Image Quality Assesment: PSNR, HVS, SSIM UIQI," International Journal of Scientific & Engineering Research, vol. 3, pp. 11-5, August 2012. M. Cadik and P. Slavik, "Evaluation of Two Principal Approaches to Objective Image Quality Assesment," 8th International Conference on Information Visualisation, vol. IEEE Computer Science Society Press, pp. 513-551, 2004. A. Hore and D. Ziou, "Image Quality Metrics: PSNR vs. SSIM," International Conference on Pattern Recognition, pp. 2366-2369, 2010. Z. Wang, L. Li, S. Wu, Y. Xia, Z. Wan, and C. Cai, "A New Image Quality Assesment Algorithm based on SSIM adn Multiple Regression," International Journal of Signal Processing, Image Processing and Pattern Recognition, vol. 8, pp. 221-230, 2015. R. Kumar and V. Moyal, "Visual Image Quality Assessment Technique using FSIM," International Journal of Computer Applications Technology and Research, vol. 2, pp. 250-254, 2013. M. K. Raijada, D. Patel, and P. Prajapati, "A Review Paper on Image Quality Assessment Metrics," Journal of Emerging Technologies and Innovative Research (JETIR), vol. 2, pp. 130-132, January, 2015. R. Olivier and C. Hanqiang, "Nearest Neighbor Value Interpolation," IJACSA (International Journal of Advanced Computer Science and Applications), vol. 3, pp. 1-6, 2012. J. Yonghong, Digital Image Processing (The Scond Edition). Wu Han China: Wu Han University press, 2010. Z. Haifeng, Z. Yongfei, and H. Ziqiang, "Comparison of Image Amplifying Method," Modern Electronics Technique, vol. 24, pp. 33-36, 2010. W. Sen, "An Image Scalling Algorithm Based On Bilinear Interpolation with VC++," Journal of Techniques of Automation & Applications, vol. 27, pp. 44-45, 2008.
	a. L. M. J.-B. Martens, "Image Dissimilarity," Signal Processing, vol. 70, pp. 155-176, 1998. Z. Wang, A. C. Bovik, H. R. Sheikh, and E. P. Simoncelli, "Image Quality Assessment: From Error Visibility to Structural Similarity," IEEE Transactions on Image Processing, vol. 13, pp. 600-612, 2004. L. Zhang, L. Zhang, X. Mou, and D. Zhang, "FSIM: A Feature Similarity Index For Image Quality Assessment," IEEE Transactions on Image Processing, vol. 20, pp. 2378-2386, 2011. 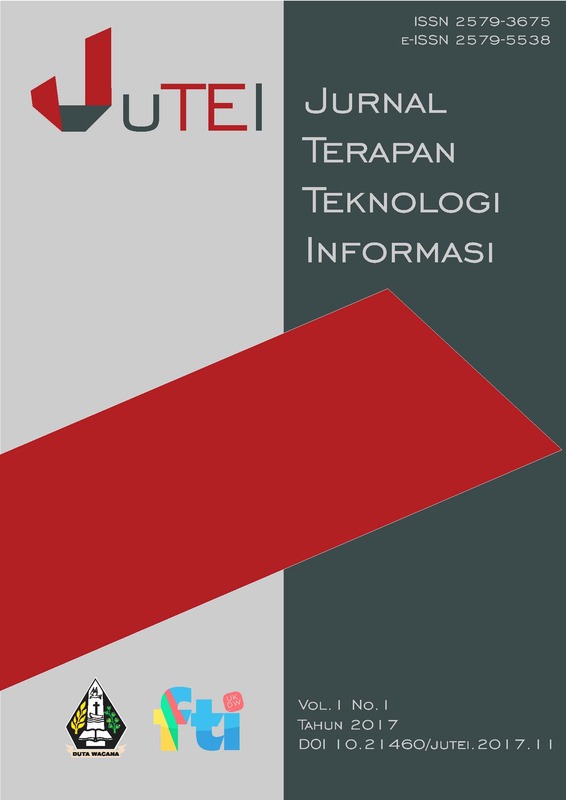 M. Wulandari, “INDEX QUALITY ASSESMENT CITRA TERINTERPOLASI (SSIM dan FSIM)”, JUTEI, vol. 1, no. 1, Apr. 2017.